I love carrot cake. However, it’s usually drowning in frosting and while good frosting tastes delicious, sometimes I just want a simple, hearty cake that’s studded with nuts and raisins. My recipe is inspired by David Lebovitz. I like this recipe for several reasons. First it uses the basic cake mix that I love: 1 cup of flour, 1 cup of sugar (I cut it down to ¾ cup though), 1/2 cup of fat (here it’s divided between brown butter and oil) and 2 eggs. It’s similar to my banana bread recipe. At least I know I will end up with a cake. Next, this recipe uses 2 whole cups of carrots. That’s a very good, probably maximum, amount of carrot for a cake, I reason, and I’m pleasantly surprised to see how well the carrot cooks into the cake while baking. Lebovitz’s cake asks for cinnamon, nutmeg and clove powder. I have cinnamon powder, but not the rest, and for now that suffices. I like his use of brown butter in the cake too – it adds a warm, nutty flavor. The brown sugar is my own idea, and I’m happy with the moistness and mild caramel flavor that it imparts to my cake. Lastly, I add pecans, because I’ve got to have nuts in this cake. This cake is moist, soft and very comforting. 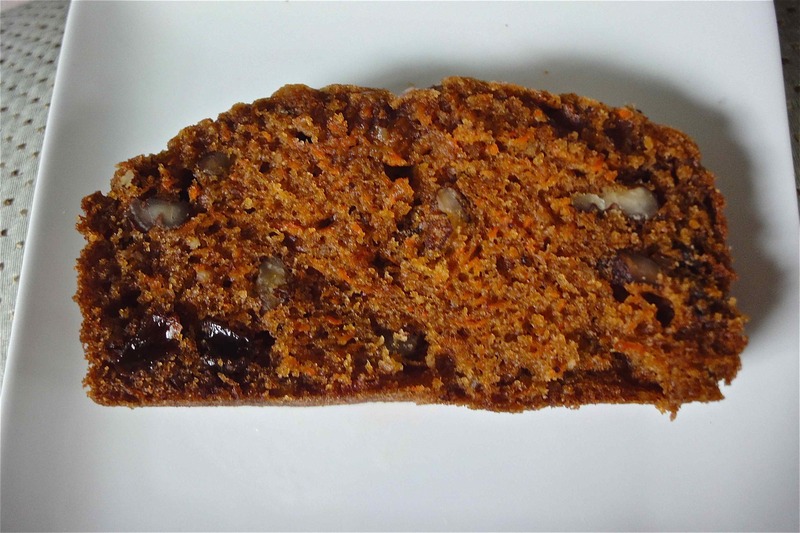 Cinnamon, vanilla and brown butter along with the carrot, pecans and raisins, add lots of interesting flavors to the cake. 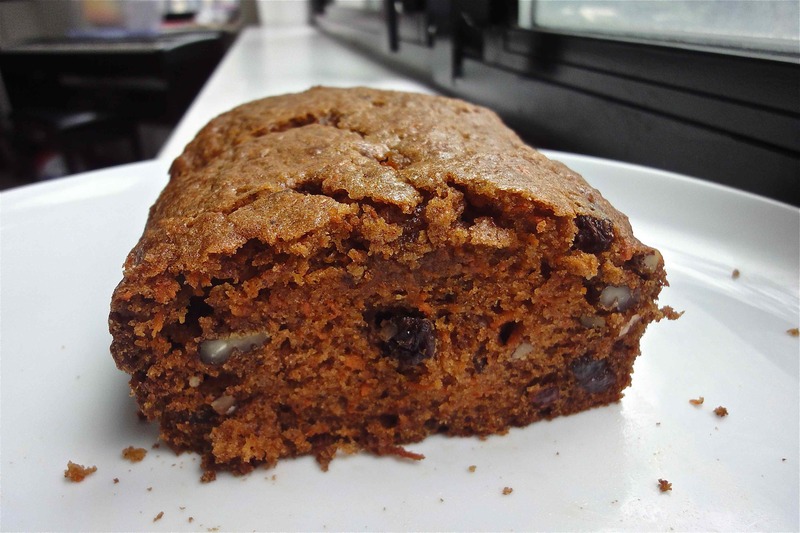 It’s a perfect tea or breakfast loaf. 1. Heat the oven to 350F. With a whisk, mix the flour, baking soda, salt, cinnamon and sugar in a bowl and keep aside. In a separate bowl, toss the raisins and the pecans with a little plain flour and keep aside. Butter and flour a 8 ½ x 4 ½ or medium loaf pan. 2. With the electric beater on the lowest setting, whip the eggs for a minute. Slowly pour in the brown butter, the oil and the vanilla while the mixer is still running. 3. Add in the grated carrots to the wet mixture with a wooden spoon or spatula. Add the dry ingredients in 2 parts, gently mixing it in with the spatula. 4. Place the ready batter into the loaf pan, and bake for about 30 minutes or until a knife inserted into the middle of the cake comes out clean. Allow to cool for several minutes before turning the cake out of the pan. Serve as is or topped with cream cheese frosting. I love this approach, especially since I’m not a huge fan of banana bread. the carrot cake customer looks even more edible than the cake itself, scrumptious as it looks! The cake didn’t meet this client’s standard of excellence though since it lacked chocolate chips and frosting. What’s a cake without chocolate or cream?! 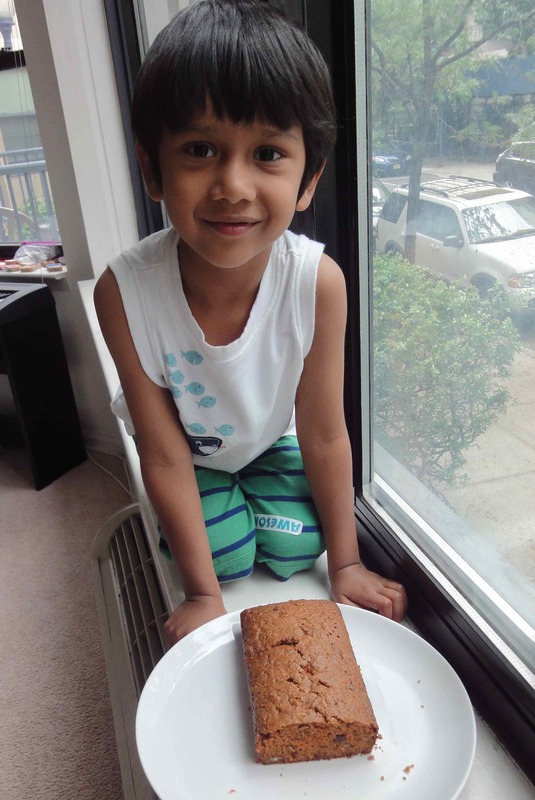 Wow Devika, I have been looking for a good carrot cake recipe for a while minus the frosting and the adding of nuts idea is excellent, will definitely try. Great recipes, keep them coming. Would LOVE your feedback…you are such a prolific baker. Thank you!